Center City District (CCD) is pleased to present the activation of the first phase of Pulse, a site-specific work of public art created for Dilworth Park by internationally renowned artist Janet Echelman, who reshapes urban airspace with a monumental, fluidly moving sculpture that responds to environmental forces including wind, water, and sunlight. 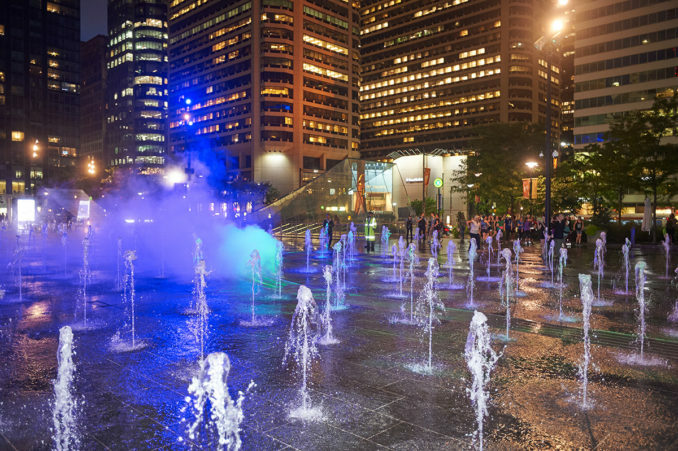 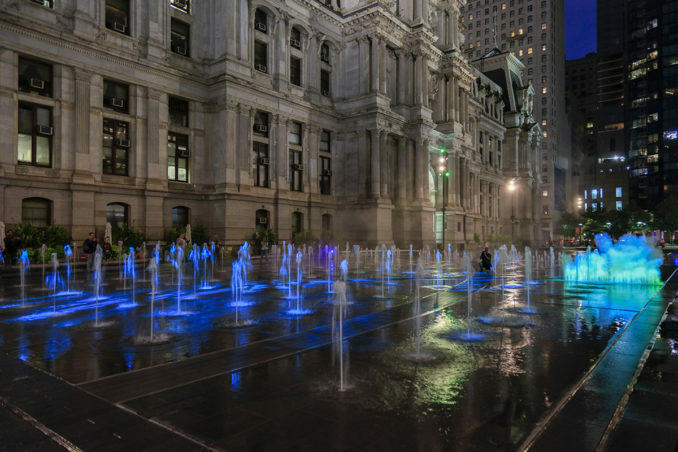 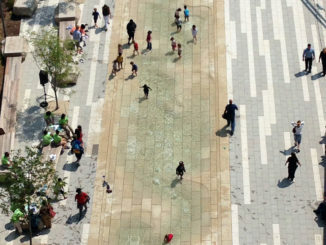 Inspired by Center Square’s history as Philadelphia’s water and transportation hub, Pulse traces in the surface of the fountain the paths of the subway and trolley lines that converge beneath Dilworth Park. 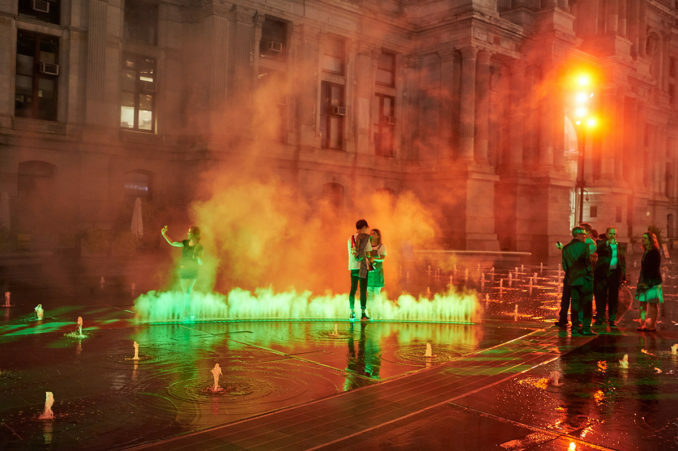 As SEPTA trains pass beneath, four-foot-tall curtains of colorful atomized mist travel across the park fountain’s surface following the transit lines that bring more than 70,000 passengers to the site each day. 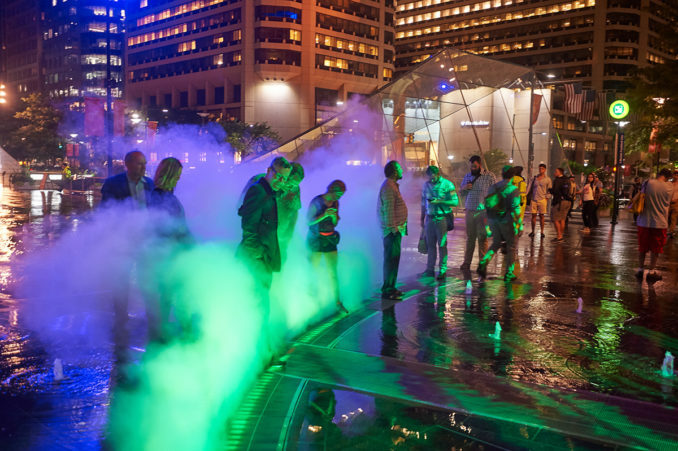 The first phase of Pulse will open on Wednesday evening, September 12th around 7:30 pm at the northern end of the fountain above the Subway-Surface Trolley Lines, also known as the green line. The launch of the first phase (green line) will help support fundraising to complete the remaining two sections of Pulse, which trace the Market-Frankford (blue line) and the Broad Street (orange line). 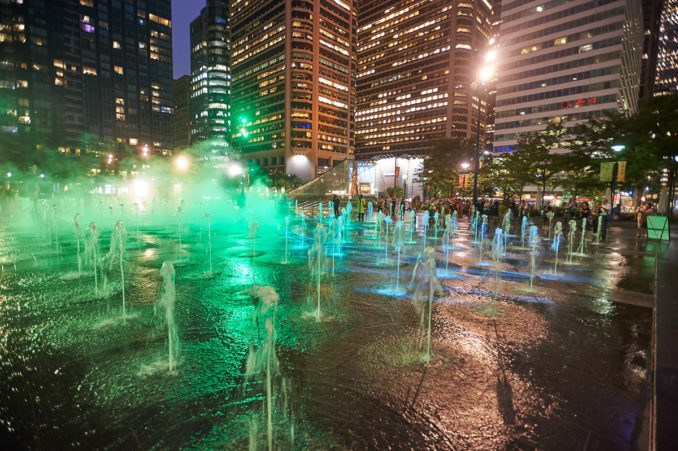 Echelman and her team worked closely with Center City District and the Dilworth Park design team, particularly lead engineer Urban Engineers, landscape architect OLIN, and water feature consultant CMS Collaborative from design concept through test mockups and final implementation. 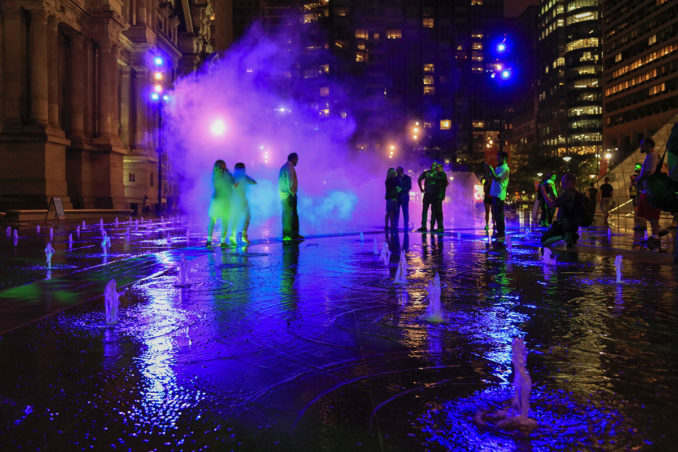 The team collaborated on fine-tuning and testing the mechanisms that provide the work’s dramatic multicolor LED illumination and traveling mist, and adjusting them for daylight and nighttime hours. 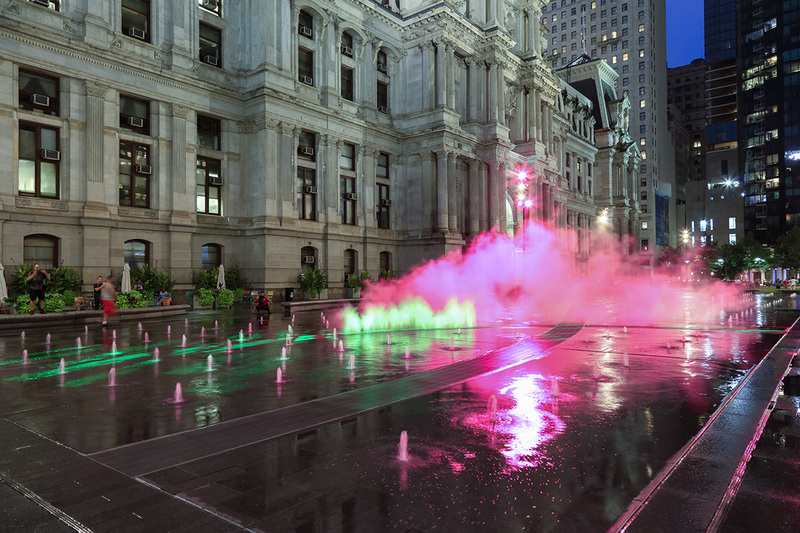 Echelman created the color for each line by blending multiple individually-colored hues of light, drawing inspiration from the ethereal paintings of Mark Rothko. In designing Dilworth Park, the CCD commissioned Echelman, who reshapes urban spaces with monumental experiential sculptures that respond to environmental forces, to create an innovative work of public art for what was then a barren, unused space. 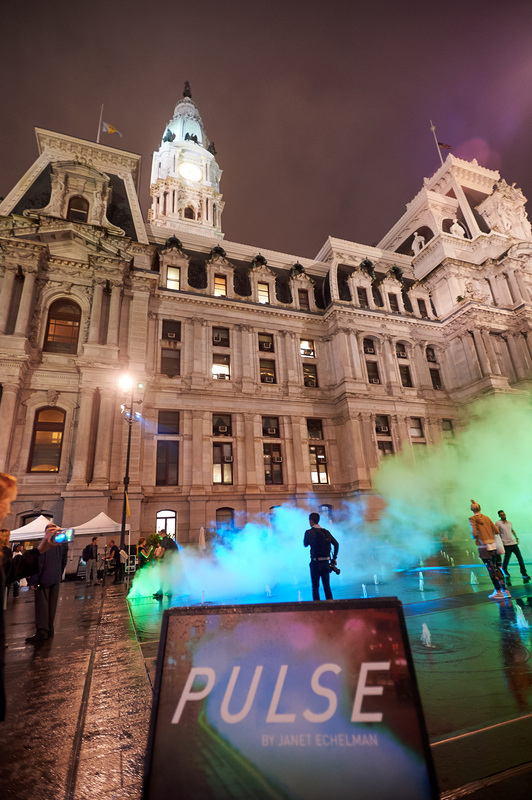 Echelman received the Smithsonian American Ingenuity Award in Visual Arts, honoring “the greatest innovators in America today,” and her TED Talk Taking Imagination Seriously has been translated into 35 languages with more than two million views worldwide. Oprah’s list of “50 Things That Make You Say Wow!” ranked Echelman’s art #1. During construction in 2014, significant infrastructure was embedded in the park’s 11,160-square-foot fountain in anticipation of the day when Pulse would make its debut. 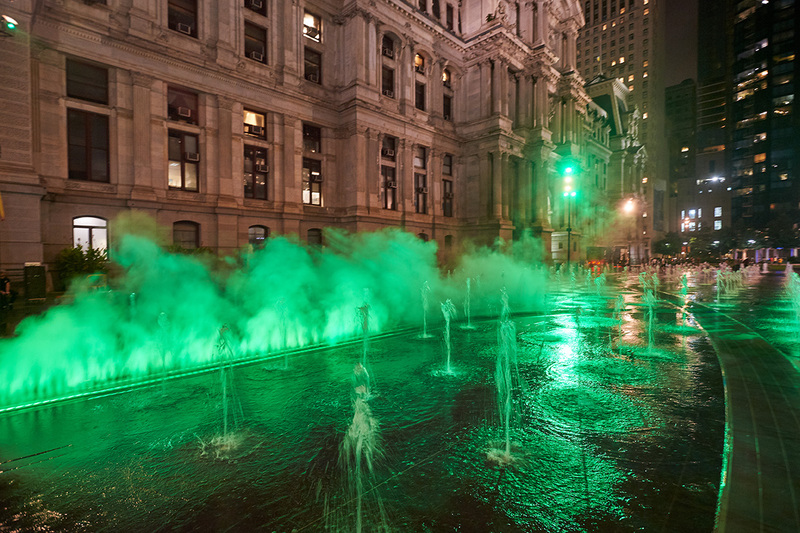 The first phase of Pulse is made possible by contributions from William Penn Foundation; National Endowment for the Arts; Knight Foundation; ArtPlace America; Poor Richard’s Charitable Trust; Barbara and Ted Aronson; Parkway Corporation; Philadelphia Convention and Visitors Bureau; Henry L. Kimelman Family Foundation; George and Karen Rosskam; PNC Bank; Diversified Search; Michael J. Edwards and Erica Rockenback; George Ahern; Roger Schwab; and Bruce S. and Wendy R. Dunn.